Zach King was one of Vandy’s pitchers who had tough times during the Super Regional against Mississippi State. The Bulldogs ousted the Commodores Sunday night 10-6 at Hawkins Field to win a berth in the College World Series. 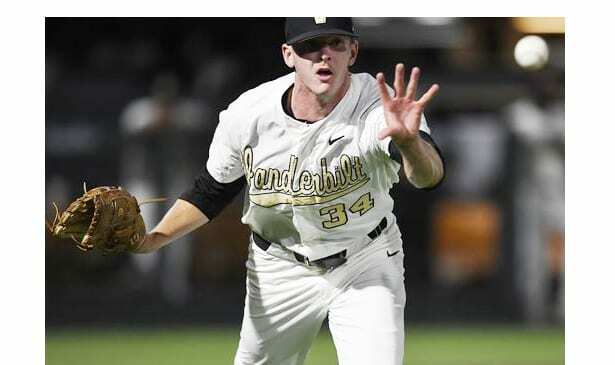 The Vanderbilt Commodores finally ran out of comebacks and rallies Sunday night in the NCAA Super Regionals, dropping a 10-6 decision to the Mississippi State Bulldogs in the 11th inning of the series third and final game. The epic contest, which took over five hours and ended sometime after midnight, saw the Commodores constantly battling back from behind, overcoming an early two-run deficit, then staging an amazing ninth-inning rally trailing 6-3. Pat DeMarco started things with a solo home run. Harrison Ray had a single, then Ethan Paul tied the game at 6-6 with a two-run homer, putting it into extra innings. But the Vandy bullpen finally collapsed in the 11th. A Josh Haffner walk was followed by a Tanner Allen single that drove in one run. The Bulldogs got another on a bases-loaded walk, and Luke Alexander’s two-run single concluded their four-run game-winning inning. Mississippi State advanced to the College World Series and is now 37-27 on the season. They got three hits and two runs batted in from Rowdy Jordan, and another two hits and two runs batted in from Jordan Westburg. Jake Mangrum added two hits, scored two runs and knocked in another. The Commodores, who finished 35-27 on the season, got two hits from JJ Bleday, who reached base for his 28th consecutive game. Ray also had two hits and scored two runs. But Vanderbilt left 17 runners on base, including three innings where they left the bases loaded. Tyler Brown (1-5) took the loss, giving up two hits, walking three and surrendering four runs in only 2/3 of an inning. Denver McQuarry (2-2_ got the win despite pitching only 1/3 of an inning. He walked one and struck out one. The Commodores lost Game 1 in dramatic fashion on a two-run homer in the bottom of the ninth inning, then won Game 2 4-3 in the same fashion with a bottom of the ninth inning solo homer. The three games at Hawkins Field were all sellouts and marked the Commodores’ 13th straight NCAA Tournament appearance under Tim Corbin.